Election years in Northern Virginia are usually a time when the real estate market takes a deep breath and pauses to see what will happen. “I’m putting my home search on hold until we see how the election shakes out” and “I’m gonna wait and see what happens to interest rates after the election” are comments we’ve heard frequently over the past twelve elections. 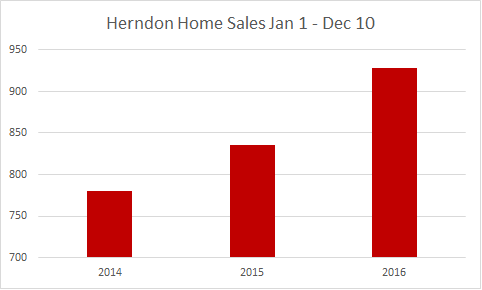 Let’s look at the market stats for some of our Northern Virginia areas and see whether that rang true this year. 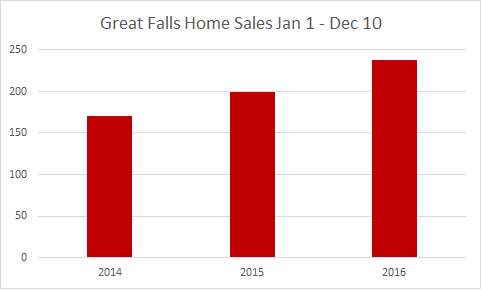 The charts below show the number of home sales year-to-date year-over-year for 2014, 2015 & 2016. And there seems to be a pretty consistent pattern. 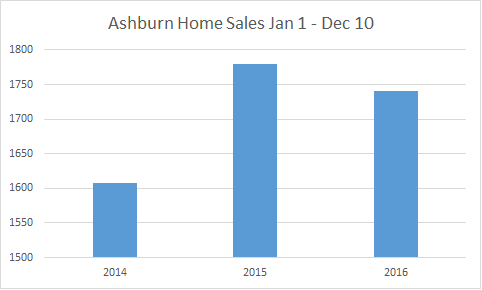 Other than in Ashburn, sales rose significantly in 2015 over 2014. And instead of the market pausing to digest the election, home sales continued to rise in 2016. This was true in Alexandria, Arlington, Great Falls, Herndon, McLean, Oakton, Reston & Vienna – as well as in a number of other areas. 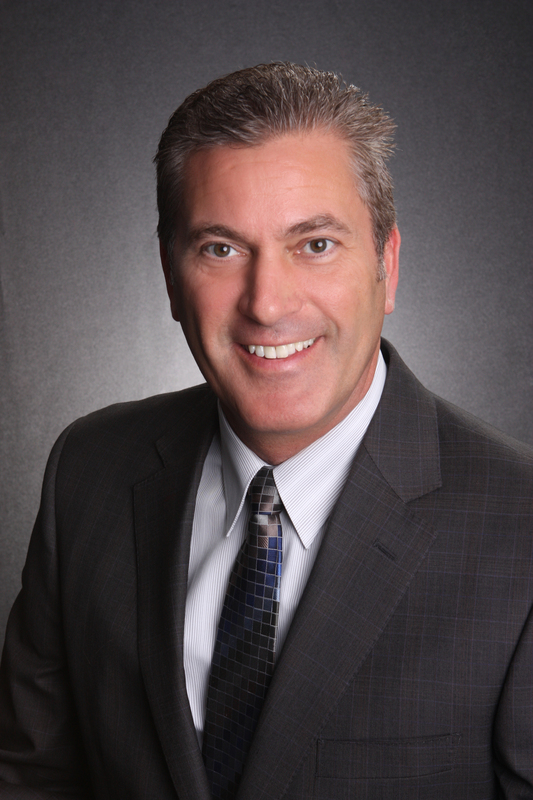 Stay tuned for our CEO Terry Belt’s 2017 Crystal Ball Predictions! (You can read his 2016 Predictions here). 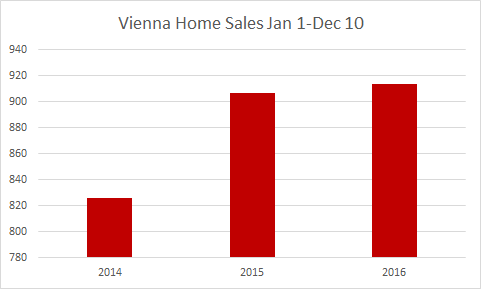 Call Terry Belt & The Belt Team at (703) 242-3975 if you’d like a market analysis for your home or neighborhood. Statistics vary wildly between cities, school districts and price ranges. And if you’re thinking of selling in 2016, NOW is the time to prepare. Did you know that in many areas of Northern VA last year, Sellers who sold in January-February sold their homes for more than those who waited for the “Spring Market”?! 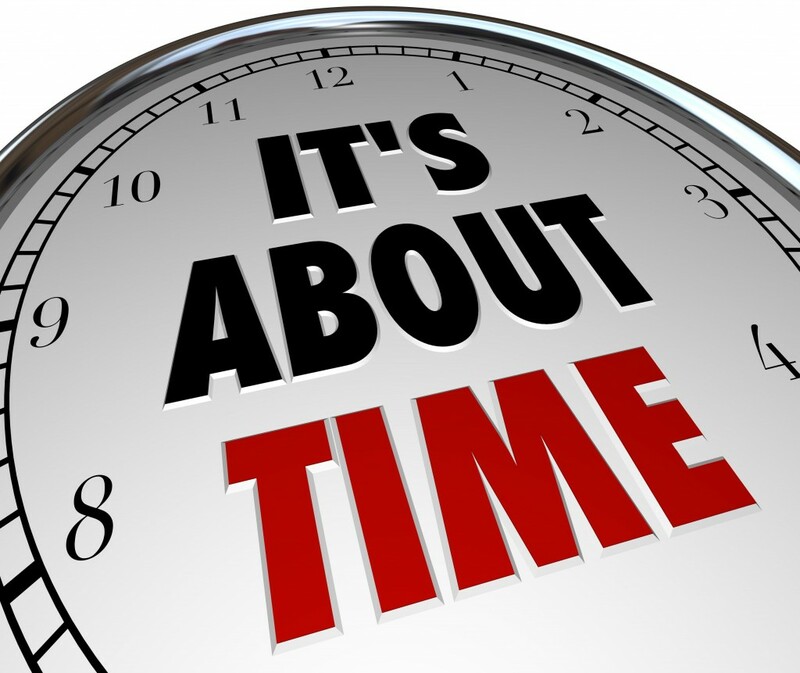 McLean Virginia: How Long To Sell Your Home and Are Prices Rising? If you’re looking to buy or sell real estate in McLean, VA in 2016, you may be wondering how long homes are on the market and whether prices are up or down. 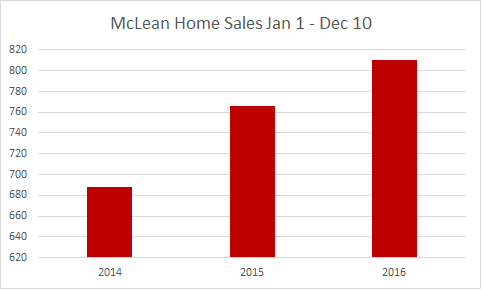 Now, to get an even better sense of what’s happening in the real estate market, go to our web site for up-to-date McLean VA housing stats on the most recent month as compared to the five year average. This will indicate what the current trends are. 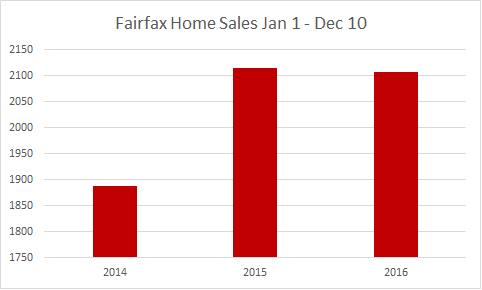 Call The Belt Team at (703) 242-3975 if you would like to buy or sell in McLean, VA. But we’re going to do it anyway! At this time of year, our phone starts ringing off the hook looking for our CEO, Terry Belt, asking for his forecast of what this year in real estate will hold. 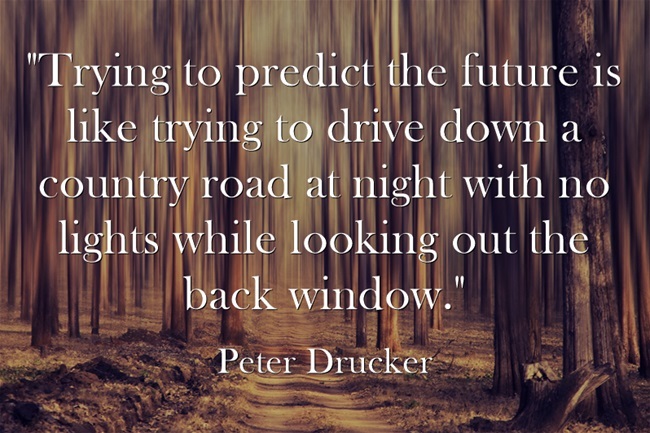 And while his crystal ball may be as imperfect as everyone else’s, he has weathered 28 years in the Northern VA real estate market and done it uber successfully. This brings with it a good look in the rear view window, but at the same time an ability to spot & react to trends quickly. Over all, we’ll see a good year in Northern VA. 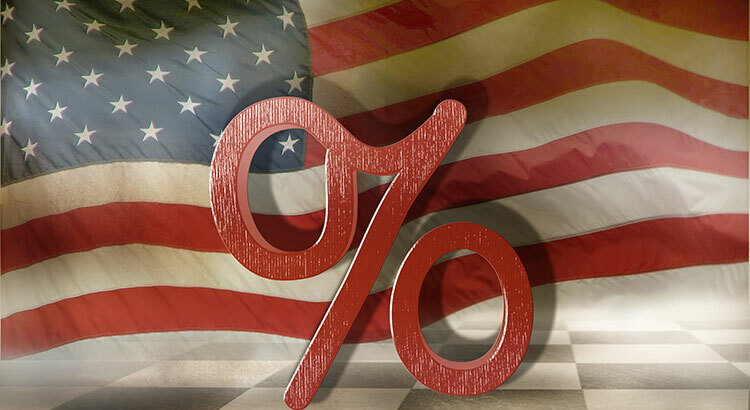 The national and local press are all telling “feel good” real estate stories and this is great as it resonates positively for consumer confidence, which is a huge factor in the market. The first half of the year will bring a very healthy market. I predict the second half of the year will soften as inventory grows. If you’re thinking about buying or selling a home in 2016, the absolute most important thing you can do is to make sure you have the best Realtor representing & advocating for you. 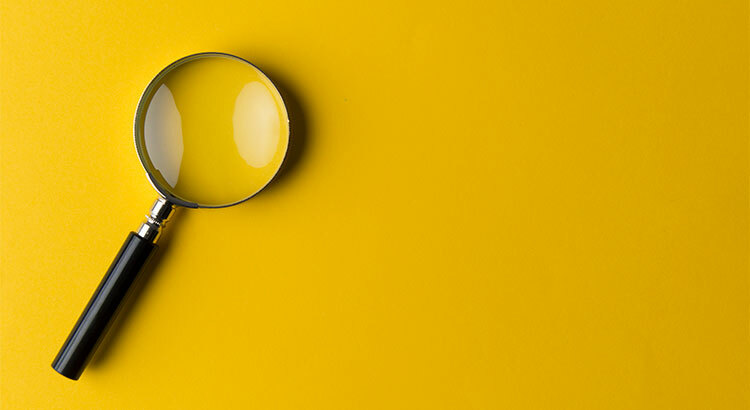 There’s a lot to navigate along the way – appraisals, surveys, legal disclosures, when to sell, how to price, how to stage, what to disclose, what not to disclose, mortgage financing, how to compete and more. Every market has its own ins & outs & idiosyncrasies. According to NAR, 90% of homes are sold by 10% of the Realtors. So my advice to clients, whether they are buying here in Northern VA or across the country in California or even across the ocean in Europe – is to make sure you work with the best. You know they’re the best when they’re in that top echelon of performers. 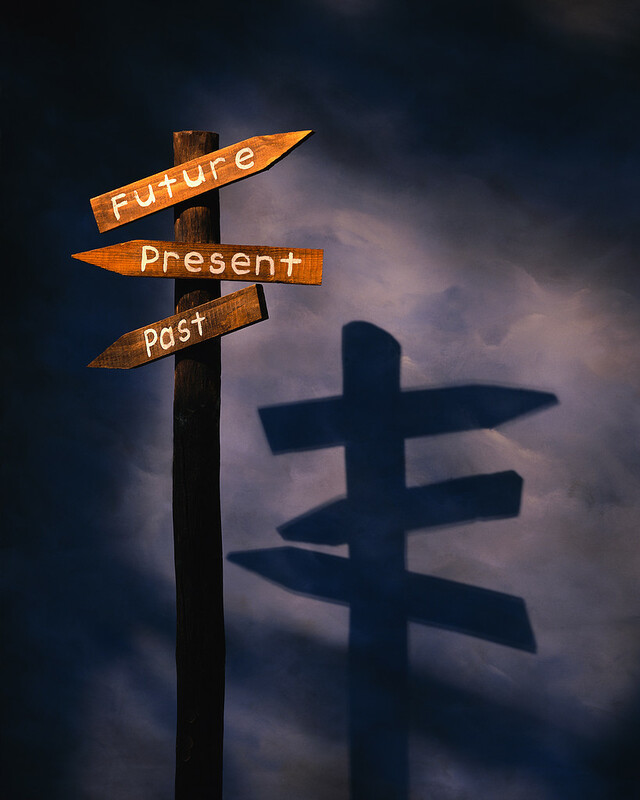 The more transactions a team does, the more prepared they are to be your advocate and help you navigate successfully. Buying or selling a home is often one of the biggest, if not THE biggest, financial transactions of your lifetime – not to mention the emotional importance of your home and family. Do it right! 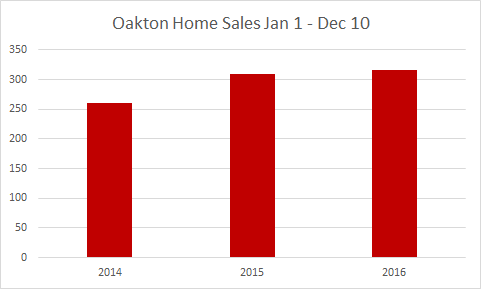 Median Days on Market – How Fast Are Homes Selling? 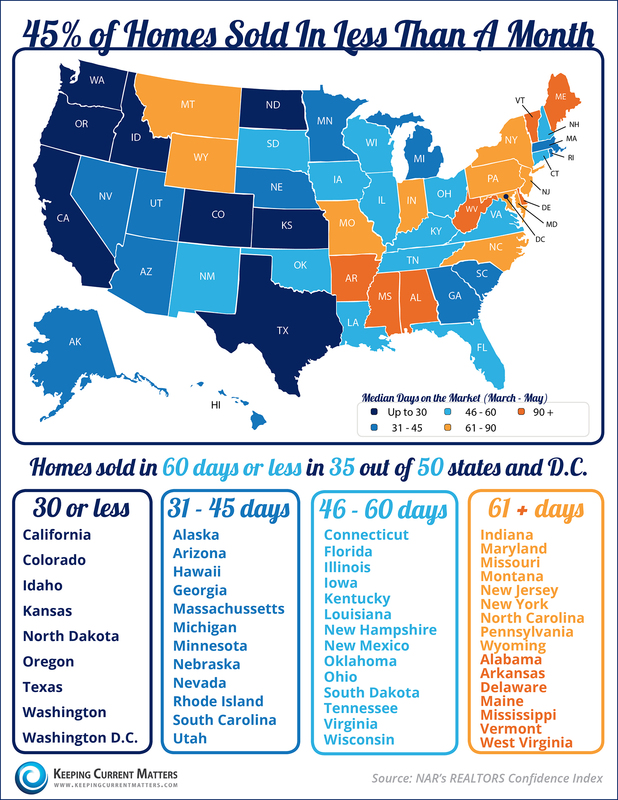 If you’re wondering how fast homes are selling around the United States, here’s a great infographic from Keeping Current Matters. Whether you’re a Buyer or a Seller, it’s important to know how quickly homes are selling in your neighborhood and/or the neighborhood you want to live in. Buyers – Knowing how quickly homes are selling tells you how quickly you need to react when you see a home you love. In some markets, homes are languishing for months. While in others, they are snapped up the day they hit the market. Taking a look at median number of days on market will help set your expectations so you don’t feel pressured. Buyers – You can use days on market as part of the criteria for determining what price to offer. If you see a property that has been on the market for a LONG time – it’s fair to assume you may want to offer something below list price – the longer the days on market, the lower the price. But if you’re making a lowball offer on a home that just hit the market – it’s unlikely the owner will accept your offer. Median days on market is just ONE of many criteria Buyers and Sellers should consider. For a personalized consultation including ALL the criteria – contact Terry Belt & The Belt Team at (703) 242-3975. We’ll help you make the RIGHT move!